Earn contributions for up to 3 of your favorite groups — just by dining out! Sign in to link your cards. 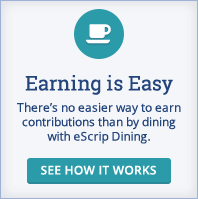 Chances are, there are eScrip Dining restaurants right in your own neighborhood! Don’t believe us? Go ahead and search for yourself.